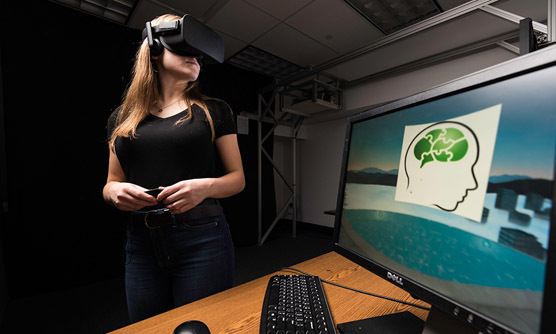 Our ongoing research on brain training in virtual reality (VR) was featured in a University Press Release. This collaboration with Jeff Bazarian (emergency medicine) and Vankee Lin (nursing) is testing whether VR will enhance the efficacy and the speed of brain training. In addition to healthy adults, this work is also focusing on athletes recovering from concussions and older adults. Jeff Nyquist's research showing that brain training can yield rapid and stable vision improvements in children with low vision was published in Scientific Reports. This work was done in collaboration with Ruyuan Zhange and Joe Lappin (University Press Release, FullText, PDF). Phil Jaekl's discovery that sound delays can be [unconsciously] used as a distance cue was published in PLOS ONE (University Press Release, FullText+PDF). Covered by Tech Times and Scientific American. Oh-Sang Kwon's model showing than a Kalman filter algorithm can explain motion and positions perception was published in PNAS (University Press Release, PDF). The model also explains the curveball illusion, motion-induced position shifts and peripheral slowing. This work was with late Dave Knill whose mathematical insight made this project possible. Covered by CBS Sports and Vox. Here are different illusions explained by the model. Below it is a super slow motion video of the curveball in action. Congratulations to Michael for receiving honorable mention for his NSF Graduate Research Fellowship application. Tadin lab gave a pair of presentations at the Rochester Museum & Science Center entitled "Visual illusions reveal mysteries of the brain." It is always fun to guess which illusions will capture the kids' attention. Ruyuan Zhang's paper on video game play and learning was published in PNAS (University Press Release). Covered by CBS News. Duje Tadin was awarded the 2014 Vision Sciences Society Young Investigator Award. 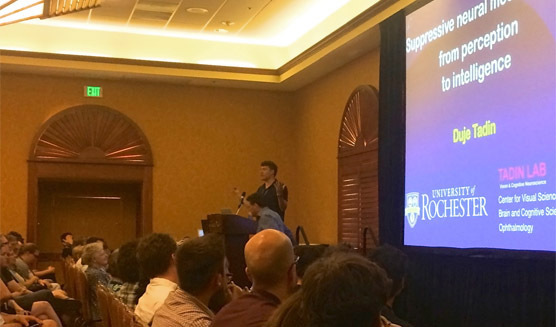 The award presentation and the lecture took place at the VSS meeting. Also at VSS, Phil and Michael had talk presentations. Woon Ju, Oh-Sang, Kevin, Davis, Ana, Matt and Aaron presented posters. Duje Tadin gave a Science Café presentation: Visual perception as a window to brain function. Earlier in the year, Tadin lab gave a pair of presentations at the Rochester Museum & Science Center entitled "Visual illusions reveal mysteries of the brain." Covered by NPR and CNN (in-depth coverage by io9). The Scientist gave a nice account on how this study evolved, starting a decade ago during Duje's postdoc with Randolph Blake and finishing at U of Rochester where Kevin took a lead role. A collaboration with Joris Vangeneugden, Marius Peelen and Lorella Battelli revealed new insights into neural mechanisms of biological motion perception. This study, combining neuroimaging, brain stimulation and psychophysics, was published in The Journal of Neuroscience (PDF). Lorella was interviewed by RAI (Italian TV). The part about our study starts about 11 min into the video (in Italian). Davis Glasser is the first student to earn a PhD in the Tadin Lab! After four years as a graduate student, he is now in David Heeger's lab at NYU. A month later, Kevin Dieter successfully defended his PhD dissertation! After five years in the lab, he joined Randolph Blake's lab at Vanderbilt. Our paper revealing a surprisingly strong link between visual perception and IQ was published in Current Biology (PDF, University Press Release). Nice work, Michael! Covered by BBC and NBC News. A video produced by UR has over 2 million hits on YouTube! Below it is a video we helped produce for The Telegraph -- not as flashy, but certainly more accurate to the actual task that we used (Important disclaimer: even the The Telegraph video cannot accurately measure your spatial suppression, and thus cannot be used to estimate your IQ). Here is our main result. Note a two-fold enhancement of motion perception at high contrast (lower numbers = better performance). Woon Ju gave a lecture about brain science and her career in the Citizen U after school program. Tadin lab gave a pair of presentations at the Rochester Museum & Science Center entitled "Visual illusions reveal mysteries of the brain." Covered by MSNBC, Scientific American, Time Magazine, The Telegraph, Wired and CBC Radio. The "results" of the paper were also featured on SNL Weekend Update! Covered by New Scientist, Science Daily and Live Science. Here is a demo that we put together to illustrate perceptual consequences of motion adaptation (although on a much longer timescale than described in Davis' paper). Just start the movie, and keep your eyes in the center. After a few iterations, Rocky (the UR mascot) will start expanding.